Writer Alan Gordon’s introduction to his collected 15-chapter tale The Once & Future Tarzan is a self-confessed love letter to John Greystoke the third. More precisely, to the various incarnations the Lord of the Apes has inhabited over the years, from savage to socialite, strongman to spy – of which all of what follows is homage. 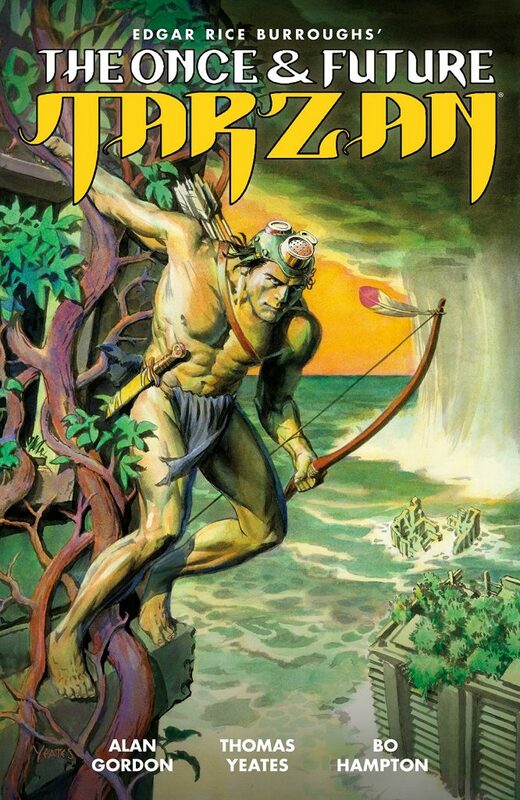 There is no doubting Gordon’s passion for the character and the detail of his world, yet – and I say this as a fellow Tarzan fan, especially when his narrative is at its most fantastic – I couldn’t help but feel that at some point in these proceedings the publishers and editors at Dark Horse allowed passion to get a little lost in the jungle and stray dangerously close to the muddied waters of indulgence. There’s nothing essentially wrong with anything here, yet at the same time there’s something not quite right either, whether it be the awkwardly balanced – by far too much time is devoted to a crisis with a submarine – and somehow strangely underwhelming story arc, or a layout that at times seems to wantonly defy sequential art and dialogue protocols, leaving you with the feeling the pages have been dropped on the floor, broken, then reassembled with small but essential pieces misplaced or even missing. There’s also a tendency for Gordon to dump great tracts of quoted prose or poetry into the midst of anything and everything, perfectly fine if you like your comics enriched this way, but not to this point of overkill. Speaking of, the dialogue itself is only marginally less guilty of same. There are points in the book where dialogue balloons struggle for space with quotations, because Tarzan and his mate and all theirmates sure do talk a lot. I mean, really, really, talk a lot. And mainly about themselves. It’s as if Gordon wanted to get under the skin of his characters but didn’t know when to stop: had never learned the editorial maxim that less is more.